Always wear eye protection when working around batteries. I will present this as complicated as my simple mind can handle. These numbers mean nothing to us. First off, storage batteries are rated in Amp Hour capacity. It can be shown in a 5 hour, 10 hour, 20 hour or 100 hour discharge rate. The slower you draw power from a battery, the more you will get out of it. Usually they based on the 20 hour rate. Please consider that you will never get the full store of energy from a battery. still energy left in the battery. Use these amp hour capacity numbers as a guide. is left in a battery. In a lead acid battery, the electrolyte is a solution of distilled water and sulphuric acid. This will push the hydrometer (float) higher in the glass tube. 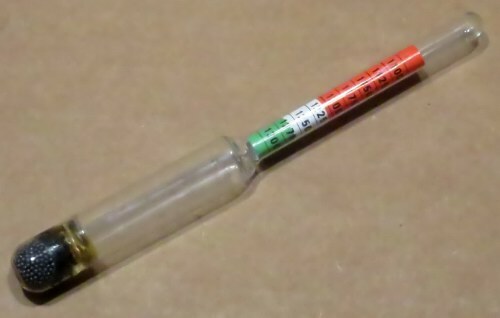 Some hydrometers also have a thermometer and temperature adjustment scale inside. But they have their limitations. cause it to show a lower specific gravity. bring up the density and show an incorrect specific gravity. state of charge based on the specific gravity. battery as well as in each cell. of charge of a battery. It also suffers from the same pitfalls as when using a hydrometer. You would want to let the battery rest before relying on the voltage to to check its state of charge. 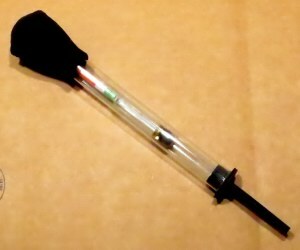 It can also be used, like a hydrometer, to check for weak cells.